The Big Bang Snowboard Show is back for 2018 and bigger than ever! 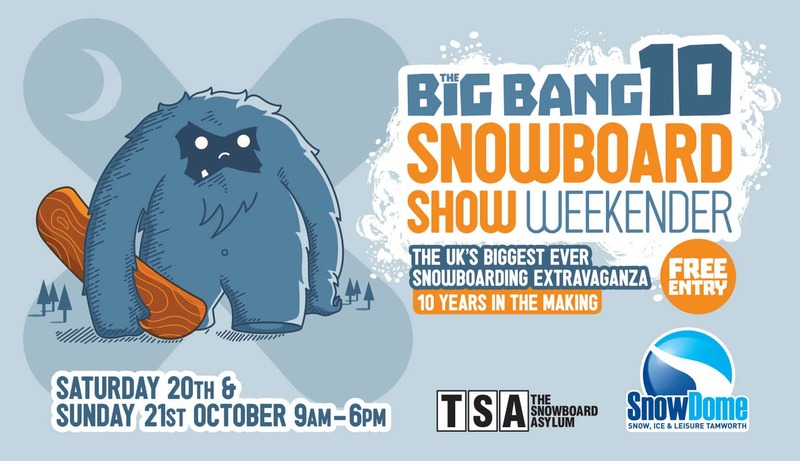 The Snowboard Asylum and Tamworth SnowDome will be bringing you two whole days of snowboarding action for the 10th anniversary special of the Big Bang Snowboard Show. Block off your calendar for Saturday 20th & Sunday 21st October! MINT Snowboarding founder and instructor Tammy Esten will be there to meet you as well as running coaching sessions which are free to join. Tammy will be running Women’s Coaching Sessions as Kids Riding Sessions for 4-8 year olds. Get signed up here. Free Burton Riglet Sessions – An introduction to snowboarding for kids 3-6 years in the Riglet fun park. A fun and easy session to give them a taste for mini-shred snowboarding! Snowboard Beginner Taster Lessons – These lessons are ONLY £10 for adults & children 7 years+. A great way to give snowboarding a go for those who are total newbies. The UK’s Biggest Free Hardware Demo – Get the chance to test out all the winter 19 kit before you commit to buying. Free Snowboard Coaching Sessions – with MINT Snowboarding, Definition, Booby Trap, Snowboard Coach to fine tune your skills. Make sure you sign up in advance here. Avalanche transceiver training with Ortovox – An introduction or refresher into the use of an avalanche transceiver. If you enjoy venturing into the backcountry then this session is a great pre-season recap on mountain safety skills. Head to the SnowDome site to get a full program of what’s on as well as get booked on the weekend sessions. We look forward to seeing you soon for a pre-season snowboard extravaganza!